In a landmark judgment, the Supreme Court has unanimously ordered that the government must submit a proper new air quality plan for the UK to the European Commission no later than 31 December 2015. Importantly, the Court also ruled that there should be provision for liberty for ClientEarth to apply for the determination of such issues as and when they arise in the course of the production of the plan, without the need for the expense and delay of new proceedings. “Three cheers for ClientEarth’s victory in the Supreme Court after a five year legal battle. It’s very appropriate that the Supreme Court has ruled in the dying days of this Government to hold it to account. 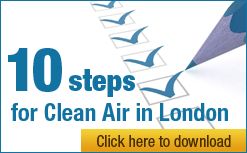 “The first job of the next Government will be to produce a proper air quality plan and take immediate action to meet legal limits for nitrogen dioxide, currently breached up to three fold in central London, that have been in legislation since 1999 to be met by 2010. Boris is responsible for London so must do much better than promise compliance after 2030.